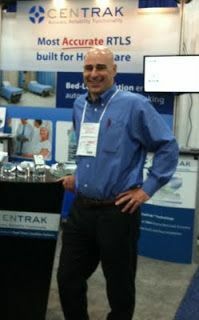 We had lots of great conversations with Biomedical and Clinical Engineering folks at AAMI 2011 in San Antonio, TX. It was great to hear that so many hospitals are taking a serious look at RTLS for asset locating and management. However, one troubling theme kept recurring – these professionals, undoubtedly one of the most obvious end users of an asset locating solution, had awareness that RTLS was being evaluated at their hospital but did not seem to be heavily involved in the final decision. How come? Why are they not more empowered in the decision making process? How can they begin to change this dynamic so the key requirements known best to them, define the selection criteria? The RTLS decision process seems very complex — there are so many variables, and system end users such as Biomed (and Nursing) can understandably struggle correlating which differentiating factors will affect them the most once the system is installed. Getting Biomed (and Nursing) fully educated about available RTLS systems is essential to making them have a stronger voice in the decision-making process. The simple truth – putting aside all the different frequencies and technologies of various RTLS systems, one really needs to just keep the “eyes on the prize”, and champion a system that delivers 100% certainty room and bay-level accuracy at update speeds in the few seconds while running for years on a battery. CenTrak is the first and only RTLS provider to achieve this level of performance. CenTrak locates assets in real-time at the room-level and sub-room-level. This level of granularity is critical to making sure that staff members that are looking for equipment can find it immediately and there is no locating system error. Additionally, only this level of certainty provides the ability to perform automated asset management such as PAR level inventory management, contaminated equipment alerts, egress or “wrong area” equipment alerts and dozens of other automated functions. The CenTrak RTLS speed and accuracy also allows for scalability across other solutions: staff locating integrated with nurse call, temperature monitoring, patient flow, hand hygiene monitoring and many more.